↑ Kammerer, J.C. (May 1990). "Largest Rivers in the United States". U.S. Geological Survey. http://pubs.usgs.gov/of/1987/ofr87-242/। আহৰণ কৰা হৈছে: February 22, 2011. ↑ 4.0 4.1 "Lengths of the major rivers". United States Geological Survey. http://ga.water.usgs.gov/edu/riversofworld.html। আহৰণ কৰা হৈছে: March 14, 2009. Anfinson, John O.; Thomas Madigan; Drew M. Forsberg; Patrick Nunnally (2003). 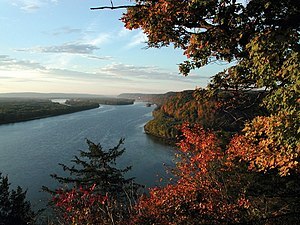 The River of History: A Historic Resources Study of the Mississippi National River and Recreation Area. প্ৰকাশক St. Paul, MN: U.S. Army Corps of Engineers, St. Paul District. OCLC 53911450. Bartlett, Richard A. (1984). Rolling rivers: an encyclopedia of America's rivers. প্ৰকাশক New York: McGraw-Hill. ISBN 0-07-003910-0. OCLC 10807295. Penn, James R. (2001). Rivers of the world: a social, geographical, and environmental sourcebook. প্ৰকাশক Santa Barbara, Calif.: ABC-CLIO. ISBN 1-57607-042-5. OCLC 260075679. Smith, Thomas Ruys (2007). River of dreams: imagining the Mississippi before Mark Twain. প্ৰকাশক Baton Rouge: Louisiana State University Press. ISBN 978-0-8071-3233-3. OCLC 182615621. Scott, Quinta (2010). The Mississippi: A Visual Biography. প্ৰকাশক Columbia, Missouri: University of Missouri Press. ISBN 978-0-8262-1840-7. OCLC 277196207. Pasquier, Michael (2013). Gods of the Mississippi. প্ৰকাশক Bloomington: Indiana University Press. ISBN 978-0-2530-0806-0.